The airway epithelium regulates responses to aeroallergens, acting as a physical and immunological barrier. In asthma, epithelial barrier function and the expression of adherens junction protein E-cadherin is compromised, but it is unknown whether this is cause or consequence of the disease. We hypothesized that airway epithelial loss of E-cadherin is a critical step in the development of manifestations of asthma. We generated a transgenic mouse model with conditional loss of E-cadherin in lung epithelial cells at birth and onwards. 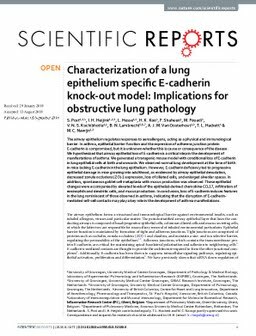 We observed normal lung development at the time of birth in mice lacking E-cadherin in the lung epithelium. However, E-cadherin deficiency led to progressive epithelial damage in mice growing into adulthood, as evidenced by airway epithelial denudation, decreased zonula occludens (ZO)-1 expression, loss of ciliated cells, and enlarged alveolar spaces. In addition, spontaneous goblet cell metaplasia with mucus production was observed. These epithelial changes were accompanied by elevated levels of the epithelial-derived chemokine CCL17, infiltration of eosinophils and dendritic cells, and mucus production. In conclusion, loss of E-cadherin induces features in the lung reminiscent of those observed in asthma, indicating that the disruption of E-cadherin-mediated cell-cell contacts may play a key role in the development of asthma manifestations.